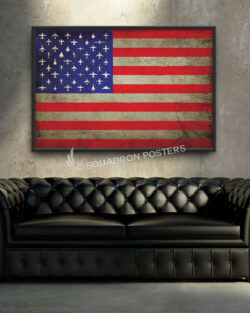 Vintage Style Aviation American Flag Art. The flag of the United States of America, often referred to as the American flag, is the national flag of the United States. It consists of thirteen equal horizontal stripes of red (top and bottom) alternating with white, with a blue rectangle in the canton (referred to specifically as the “union”) bearing fifty small, white, five-pointed stars arranged in nine offset horizontal rows, where rows of six stars (top and bottom) alternate with rows of five stars. The 50 stars on the flag represent the 50 states of the United States of America, and the 13 stripes represent the thirteen British colonies that declared independence from the Kingdom of Great Britain and became the first states in the U.S. Nicknames for the flag include the Stars and Stripes, Old Glory, and the Star-Spangled Banner. The current design of the U.S. flag is its 27th; the design of the flag has been modified officially 26 times since 1777. The 48-star flag was in effect for 47 years until the 49-star version became official on July 4, 1959. The 50-star flag was ordered by the then president Eisenhower on August 21, 1959 and was adopted in July 1960. It is the longest-used version of the U.S. flag and has been in use for over 57 years. 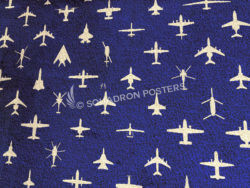 In honor of American Aviators, Squadron Posters designed this Vintage Style Aviation American Flag Wall Art. This American Flag Art features 50 different U.S. Aircraft in 4 different styles; Tan, Black, Classic and Vintage. Both the 32×48 and 20×30 sizes are available with an installed floating frame and printed on high quality canvas with a solid-core interior, this artwork can be obtained HERE.